Named after Sir John Philpot (Lord Mayor of London between 1378-1379), Philpot Lane links Eastcheap and Fenchurch Street. These two small fellows can be found half-way up a building which sits on the south-eastern corner of Philpot Lane, just by the junction with Eastcheap. The builders in question were working on ‘The Monument’; a towering column which stands on the junction of Fish Street Hill and Monument Street, about 400 ft. away from Philpot Lane. Built between 1671-77, the Monument was designed to commemorate the Great Fire of London, which had destroyed a vast part of the City a few years before. Its architect was one of London’s finest; the incredible Sir Christopher Wren. Testament to Sir Wren’s genius, the Monument, to this day, remains the tallest, isolated stone column in the world. At some point during the Monument’s construction, the two builders mentioned earlier sat down to enjoy their packed-lunch of bread and cheese. However, something was amiss… one of the men’s sarnies had been nibbled away to almost nothing! For some reason, the victim of this food theft immediately blamed his mate sitting beside him and a fight broke out- not wise when you’re poised so high up. Trading punches, the unfortunate pair lost their footing and plunged to the ground, both being killed instantly. An infestation of tiny mice. The Mice Eating Cheese memorial… where to find it! Many thanks, John- really appreciate your kind comment. Thanks! Hope you get to see it soon! 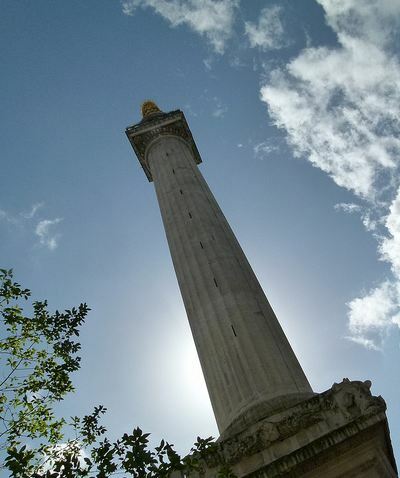 Whilst you’re there, you can visit the Monument too- for a small fee, you can enter it and take the staircase right to the top for a great view over the City. Found that whilst on the knowledge, eventually! Nice work, keep it up. Excellent! Thank you for this, it is exactly the information I was hoping for as I plan to visit London again quite soon and wanted to look for this sculpture. Best to you. Thank you Renate 🙂 Hope you enjoy your visit.